This is the first Spongebob Christmas episode made, but the second we’ve seen. 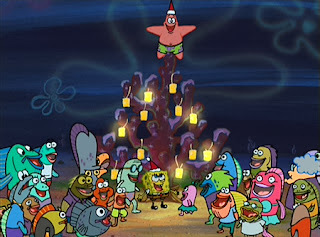 It features a bizarre framing device and a plot about bringing Christmas to the inhabitants of Bikini Bottom. It’s actually hilarious. The episode opens with a holiday-ized version of the theme song, and then launches into a live action framing sequence with a “pirate”, similar to classic children’s TV. This guy recurs throughout the episode with a terrible puppet and commentary on the episode. It’s surreal, and ludicrous. We laughed a lot. The main plot follows Spongebob himself. After Sandy the squirrel explains about Christmas and Santa, Spongebob spreads the word to the other people of the town, and helps everyone decorate and write letters to Santa (via bottle-messages). There’s a funny musical number as they prepare for Santa’s imminent arrival. Squidward, of course, doesn’t believe Spongebob, and says that everyone will be angry when Santa doesn’t arrive after all. The resolution of the plot is pretty funny, and while this isn’t an instant classic or anything, it was an enjoyable way to pass a half-hour.